The Hindu view of time can be broadly referred to as the Vedic Time System. kala (Time) is regarded as not linear or single-directional movement, like an arrow speeding from past to future. The idea of Time itself was quite advanced in Hindu Heritage. The Hindu concept talks of Rhythm or universal order which is manifested as Time. Time Rhythm range from the fast ticking of the atom to the expansion of the entire cosmos — Time unfolding within the geological process of the Earth the change of the season, the life cycle of a fly etc. Kala (Time) itself is connected to Lord Siva in Indian Heritage. Siva is called Maha Kala — “the great Time”. His consort Kali personifies the energy of Time. The Hindu kālagaņanā (chronology) does not depend on any mundane event like the birth of a person, coronation of a king or the military success of an emperor. But it depends only on the movements of various heavenly bodies in the cosmos, or in other words, on astronomical science. Judging from this viewpoint, the Indian chronology alone is scientific since all other current chronologies are based on mundane event like the birth of a person, or the victory of a race over the other, or the rule of a particular dynasty, or running away of a man from one city to another to save his life and so on. But during the British colonial rule, the foreign rulers could have been successful to inculcate the idea that the entire concept of Hindu chronology is merely a mythological fiction without having any scientific basis. As a matter of fact, those foreign rulers framed the education system of Bharatvarsha (the Indian subcontinent) with the sinister view of turning the people away from their own heritage and culture and to make them respectful to whatever is Western (see Macaulayism). The most unfortunate part of the episode is that, practically nothing has been done to counter this trend during past fifty years after obtaining freedom. As a result, most of the people of this country do not even know how rich and ancient their own culture is and, on the contrary, have developed a mentality to slight whatever is Indian. As a burning example of this trend, we are blindly following the most unscientific Christian chronology and do not even care to know what the Hindu chronology is. From a keen observation of a number of physical phenomena, it is easy to infer that they are repetitive, cyclic, and follow a definite time duration. The most evident repetitive phenomena are the solar cycle-rotation of the earth on its own axis and the revolution of the earth around the sun. Another repetitive phenomenon is that of a seed growing into a sapling, then to a plant and finally a tree. Before the tree dies it leaves behind a new seed for another tree and the cycle repeats infinitely. Every potential seed is a subtle form of the future tree having the complete information of the tree genetically encoded within it and every tree carries within it a potential seed for another future tree. Likewise the heat of the sun causes water to evaporate to form clouds, which shed their water over land , forming streams and rivers which ultimately wind their way back to the ocean, to once again repeat the cycle. Since we are very much accustomed to these phenomena, it is very easy to accept them without raising an eyebrow. Apart form these evident cycles the least understood and less apparent are the Human and Absolute Time cycles. To comprehend the Human cycle with any degree of clarity, it is essential to comprehend that the physical body is a constantly changing mass of material elements, while the soul is eternal. The soul takes a body just before birth and plays its part as a baby, infant, child, adolescent, adult and an elderly person and then leaves the body to take another body to go through a similar cycle once again. Again everybody is aware of the cyclical nature of time which means that time neither has a beginning nor an end. So logically speaking time is always represented on paper as a circle. Every second repeats itself every 60 SECONDS. (60seconds = 1 minute). Every minute repeats itself every 60 MINUTES. (60 minutes = 1 hour). Every hour repeats itself every 24 HOURS. (24 hours = 1 day). Every day repeats itself every 365 DAYS. (365 days = 1 year). Every year repeats itself in: ? ? ? ? YEARS ? So logically speaking every year should also repeat itself after a certain period of time. Can this answer be given by any human being? Can Science give us a definite answer to this question? CERTAINLY NOT. In the Hindu system, Years are named and there are 60 names. Once the 60 names are finished, the next year starts with the first name again. This goes on in a cyclic manner. Beyond this level there are 4 epochs or Yugas, namely, Krita Yuga, Treta Yuga, Dvapara Yuga, and Kali yuga. In the Vedas, Time is equated with the Kala (Consciousness Time) is the source of the divisions of time. It unites procession recession and stasis. “Kalo gatinivrtti sthiti: samdadhati” (Sankhayana Aranyaka 7.20). Time, according to Surya Siddhanta, has both its virtual and practical divisions; the former is called murta (embodied), the latter amurta (virtual or Unembodied). The Surya Siddhanta delineates that ‘what begins with prana (respiration) is called real; that what begins with truti (atoms) is called unreal. As, according to modern standards, 24 hours make 1 day and night, one finds that, 1 nādi or daņda is equal to 24 minutes, 1 vinādī is equal to 24 seconds, 1 asu or prāņa is equal to 4 seconds, 1 nimesha is equal to 88.889 milliseconds, 1 tatpara is equal to 2.96296 milliseconds and finally 1 truţi is equal to 29.6296 microseconds or 33,750th part of second. It is really amazing that the Indian astronomers, at such a long time ago, could conceive and obviously could measure such a small interval of time like truţi. It should be mentioned here that, 1 unit of prāņa is the time an average healthy man needs to complete one respiration or to pronounce ten long syllables called guravakşara. The Puranic division of the day is somewhat different. According to this, Kala (Time) is born out of Sun. The counting starts from nimesha (twinkling of an eye). (Source: Sūrya Siddhānta). 30 kshana/muhūrta (hour) = 1 ahorātra (~day). Truti is referred to as a quarter of the time of falling of an eye lid. 1 muhūrta equal to 48 minutes, 1 ghaţi equal to 24 minutes. 1 kalā equal to 48 seconds, 1 kāşţhā equal to 1.6 seconds and 1 nimeşa equal to 88.889 milliseconds as obtained above. In its daily motion, the earth rotates around its axis at a speed of nearly 1660 Km per hour and its illuminated half is called ahh (day) and the dark half is called rātri (night). From the system of units of time given above, one finds that 60 ghaţis or nādīs make 1 day and night. Vedic astronomical texts divide the above units of time broadly into two categories; (i) mūrttakālah and (ii) amūrtakālah. The units of the former kind are manifested (mūrttah) by the nature while, those of the latter kind are created by man. From this view point, ahorātra, prāņa or asu. nimeşa are mūrttakālah and the rest are amūrttakālah. Deleting the leading letter ‘a’ and the trailing ‘tra’ from ‘ahorātra’, one is left with the word horā, and from this horā, another system of measuring time, the ‘Horā System’, introduced in this country by the celebrated Hindu astronomer Varāha Mihira, by dividing a day and night into 24 horās. Many believe that from this Horā System the entire world has adopted the present practice of dividing a day and night into 24 hours and moreover, from Sanskrit horā, English hour, Latin hora and Greek ora (ωρα) have been derived. It is interesting to note here that, one can derive the names of the seven days of a week from this Horā System as well. One has to assume a lord for each horā of the day and Ravivāra is to be accepted as the first day of the week, but counting is to be made in the reverse or descending order and the fourth place gives the name of the following day. Why seven days make a week? And wherefrom the names of these seven days have come? Every Indian will be pleased to know that it is also a gift of India to the entire world. We have seen earlier that, 60 ghaţis or daņdas make one day and night or ahorātra. Indian astronomers dedicated each ghaţi of the day to a planet as its lord and derived the name of the day as per the lord of the first ghaţi of the day. The sun or Ravi being the most powerful among the planets, as well as the giver and sustainer of life, has been honoured to be the lord of first ghaţi of the first day of the week. Hence it is named Ravivāra or Sunday. In Figure-1, the lords of second and third ghaţis of Ravivāra are Mars and Jupiter respectively. Proceeding in this manner, Saturn is the lord of the 60th ghaţi of Ravivāra and the moon or Soma becomes the lord of the first ghaţi of the following day and hence it is named Somavāra or Monday (Moonday). One may notice here that in counting 60 ghaţis along the circle of Firure-1, one has to make 8 complete revolutions and 4 more planets and hence starting from a particular planet, the 5th place gives the name of the following day. In this manner one finally arrives at Śanivāra or Saturday (Saturnday) and starting from Śanivāra one observes that the next day is Ravivāra and thus the cycle is completed. It may be recalled that the Horā System is not essential for naming he seven days of a week and primarily it was done by the Vedic astronomers dividing a day and night into 60 ghaţis or 60 daņdas. 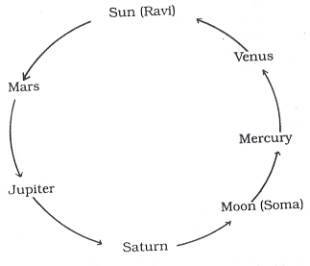 Hence, we may conclude without doubt that, it is the Vedic astronomers who named the seven days of a week using the original Indian system of dividing a day and night into 60 ghaţis and in their subsequent attempt they have shown that, one can arrive at the same results using 24 horās as well. In a verse (1/296) of Yājňavalkya Samhitā, the names of the planets are given exactly in the order of week days and hence there is every reason to believe that the names of the planets in that verse were mentioned particularly as the lords of the seven days of a week. This makes Professor S. B. Dixit to believe that the names of the seven days of a week were known in the times of Yājňavalkya Samhitā. Units of time larger than day and week are fortnight and month. The Ŗgveda says, “aruņo māsakŗvikah’’ and Ācārya Yāska in his commentary over the verse says. “aruņo arocano māsakŗņmāsānām cārddhamāsānām ca kartā bhavati” or the moon is the creator of months and fortnights. In Sanskrit the moon is called candramas and the word māsa has been derived from the parting syllable ‘mas’ of candramas. So it appears that, during the Vedic period people counted months and fortnights according to the phases of the moon. According to Professor S. B. Dixit, it was quite natural since one has to ascertain the duration of a solar month by tedious calculations, while lunar months arc visible to the naked eye and he writes, “Therefore it is clear that solar months came into being afterwards”. Samvatsara is a Sanskrit term for "year". In Hindu tradition, there are 60 Samvatsaras, each of which has a name. Once all 60 samvatsaras are over, the cycle starts over again. The sixty Samvatsaras are divided into 3 groups of 20 Samvatsaras each. The first 20 from Prabhava to Vyaya are attributed to Brahma. The next 20 from Sarvajit to Parabhava to Vishnu & the last 20 to Shiva. Once the 60 names are finished, the next year starts with the first name again. This goes on in a cyclic manner. The units of time larger than a year are called yugas. The word yuga has been derived from yoga and yoga from samyoga, or conjunction of heavenly bodies. So one finds the origin of every unit of yuga to a specific conjunction of the heavenly bodies in the sky. In Indian astronomy, starting from a mere 5 year yuga to a vast Mahāyuga of 4,320,000 years are in vogue. Every 5 year, a conjunction of the sun and the moon occurs at the asterism Dhanişthā in the zodiacal sign Makara (Capricorn). The sun enters Makara, in the month of Māgha. Hence the conjunction recurs every 5 year on the new-moon day in the month of Māgha and that is the basis of counting a 5 year yuga. The Vedānga Jyotisa provides special names for these five years and they are Samvatsara, Parivatsara, Idāvatsara. Anuvatsara and Idvatvatsara [VS: 26/45, 30/16; TB: 1/4/10;111/4/1-4). The planet Vŗhaspati (Jupiter) takes 1 year to cover a zodiacal sign and hence takes 12 years to complete its journey through all the 12 signs of the zodiac. This is the basis for counting a 12 year yuga and since it originates from the motion of Vŗhaspati, it is often called the Vrāhaspatya-yuga. It would be relevant to mention here that the Kumbha-Mela is held when Vŗhaspati enters the house of Kumbha (Aquarious) and hence the festival recurs every 12 years. From the facts narrated above, one observes that a conjunction of the sun and the moon at Dhanişthā, while the Vŗhaspati (Jupiter) at makara (Capricorn), occurs every 60 years and that is the basis for counting a 60 year yuga. Hindu scriptures provide separate names for all the sixty years of a 60 year yuga. The rare occasion when the sun, the moon and Vŗhaspati (Jupiter) meet at dhanişthā repeats at an interval of 865 million years. Such a conjunction occurs five times in a Kalpa. Beyond this level there are 4 epochs or yugas, namely, Krita Yuga, Treta Yuga, Dvapara Yuga, and Kali Yuga. All these four yugas together is called a chatur yuga, which means "four epochs"or also termed maha yuga that means "great epochs". Together a chatur yuga constitutes 4,320,000 human years and the lengths of each chatur yuga follow a ratio of (4:3:2:1:). The ages see a gradual decline of dharma, wisdom, knowledge, intellectual capability, life span and emotional and physical strength. human lifespan lakh of years and death occurs only when willed. lifespan is 10,000 years. lifespan is 1,000 years. lifespan is 100 or 120 years. The lifespan of the Devas is 100 years of the Devas (= 36,000 human years). In this cyclic process of time, 1000 chaturyuga or mahayuga period is called a Kalpa, and period of time is equal to a daytime for the Brahma, the creator of the universe. A thousand and a thousand (i.e. two thousand) chaturyuga-s are said to be one day and night of Brahmā (the creator). At the beginning of creation begins the day of creation. At the end of that goes back all of the creation of the Absolute. This is a Kalpa a cosmic cycle of becoming and either of creation and destruction. 07. Vaivasvata — Vaivasvata is the son of the Sun God. <—- We currently live here. 71 cycles of chatur yuga is called a manvantara. At the end of each manvantara period, there comes a partial devastation period, which is equivalant to the duration of krita yuga. This means after every manvantara period, the world is partially destroyed and recreated. A Manvantara is one of the 14 sub-units of a cosmic creation and lasts for 710 days or 306 720 000 solar years. 306 720 000 years. A Manvantara is divided into a total of 71 Mahayugas ( "big Yugas"). Currently, we live the 28th Mahayuga. Mahayuga of the 7th Manvantara. The Mahayugas close to each other seamlessly, without having a period of twilight to be separated. Brahma (the creator) lives for 100 years of 360 such days and at the end, he is said to dissolve, along with his entire Creation, into the Paramātman (Eternal Soul). The scriptures put Brahma's age at 100 years in his unique time scale. Brahma's life span is equal to 311,040,000,000,000 human years. This period in named as maha kalpa. A universe lasts only for one maha kalpa period. At the end of it the universe is completely destroyed together with the creator Brahma and a new universe would be created with a new Brahma. This cycle goes on endlessly. The Vedic universe passes through repetitive cycles of creation and destruction. During the annihilation of the universe, energy is conserved, to manifest again in the next creation. How old is the universe on this day of Brahma? Prior to the creation of the universe, Lord Vishnu lies asleep on the ocean of all causes. He rests upon a serpent bed with thousands of cobra-like hoods. While asleep, a lotus sprouts from His navel. Upon this lotus is born Brahma the creator of the universe. Lord Brahma lives for a hundred years and then dies, while Lord Vishnu remains. One year of Brahma consists of three hundred and sixty days. At the beginning of each day Brahma creates the living beings that reside in the universe and at the end of each day the living beings are absorbed into Brahma while he sleeps on the lotus. On day of Brahma is known as a KALPA. Within each KALPA there are fourteen MANUS and within each MANU are seventy one CHATUR-YUGAS. Each CHATUR-YUGA is divided into four parts called YUGAPADAS. 13. A lunar month, of as many lunar days (tithi); a solar (saura) month is determined by the entrance of the Sun into a sign of the zodiac; twelve months make a year. This is called a day of the gods. 14. The day and night of the devas are mutually opposed to one another. Six times sixty of them are a year of the devas. 17. The tenth part of a chatur-yuga, multiplied successively by four, three, two, and one, gives the length of the krita and the other yugas: the sixth part of each belongs to its dawn and twilight. 18. One and seventy chatur-yugas make a manu; at its end is a twilight which has the number of years of a krita-yuga, and which is a deluge. 19. In a kalpa are reckoned fourteen manus with their respective twilights; at the commencement of the kalpa is a fifteenth dawn, having the length of a krita-yuga. 20. The kalpa, thus composed of a thousand chatur-yugas, and which brings about the destruction of all that exists, is a day of Brahma; his night is of the same length. 21. His extreme age is a hundred, according to this valuation of a day and a night. The half of his life is past; of the remainder, this is the firsts kalpa. 23. Of the present, the twenty eighth chatur-yuga, this krita yuga is past……..
ALL THE BEINGS OF THIS UNIVERSE INCLUDING CHATURMUKHA BRAHMA AND OTHER GODS ARE RULED BY TIME. THEY ARE CREATED, LIVE AND ARE DESTROYED BY ONE SUPREME AND POWERFUL BEING , WHO HAS NO BIRTH OR DEATH. (1) Nitya Pralaya (2) Naimittika Pralaya (3) Maha Pralaya and (4) Aatyantika Pralaya. Nitya Pralaya is the sleep or by an extension thereof, Death. Naimittika Pralaya is the end of a single day of Brahma, when the three worlds (Bhuh:, Bhuvaha: and Suvaha:) disintegrate. Maha Pralaya is the great deluge at the end of the age of one Brahma ,which consists of 100 Brahmic Years (365 Times 2,000 ChaturYugas). Aatyantika Pralaya is "the final deliverance or the attainment of Salvation by a Jivan and after that the Jivan is never again in the clutches of Karma nor bound by the tight ropes of Samsara.It is therefore a variable time span conditioned by the practise of the different kind of Yogas or Prapatti. After these definitions of Units of Kaala and the alloted life spans of the Humans and Gods, we come to the concept of Kaala in the Nitya Vibuthi or Sri Vaikuntam. Since, Kaala is omnipresent, it has to be in Sri Vaikuntam also. However, it does not have the same power as in Leela Vibuthi or the Physical Universe, which serves as the play ground for Sriman Narayana. Kaala in Sri Vaikuntam is powerless and hence does not bring about growth, decay or destruction of any thing. Hence all there have eternal existence. Kaala is helpful there only "to describe one action as taking place before or after another. For instance in the service that the Muktas do to Sriman Narayana , they give a bath (Snana) at a point of time previous to that in which they offer food(Bhojana). It is all day there for ever and there is no division into day and night. Kaala is under the control of Sriman Narayana and he manipulates it as He likes it. It is used as an Instrument by Him in bringing about the modification of the various objects in Lila Vibhuti." Of course there is a fascinating angle to the Vedic Concept of Time. The division of a second to a paramanu (60,750th of a second), for example - the paramanu exists because it must have been used for mathematical calculations for science, astronomy etc. Why else would they even have these definitions. But Where I disagree with this article is - the division of time to its smallest possible duration (paramanu) or its longest duration (yugas) still implies that time is linear. Just because a seed turns into a sapling and then into a tree, and then dies only to give birth to another tree before it dies, doesn not imply that time itself is cyclical. Vedic concept of time says - that al time is simultaneous, all events exisit simultaneously. There is no beginning and no end. And that time does not go from one phase to another phase. All things (past, present, future) exist simultaneously. What we see as cycles, in reality neither begin nor end. That is the concept which is difficult to understand. Even the scientists are beginning to say that if time where linear, time itself could not exist. In reality, everything in nature observed is in cycles-like the examples given in this article which gives events from smallest to largest. In modern science too our reference is atomic clock. Even here an event or period is one complete cycle. This may appear linear to us to our current dimensions but it may not be linear to cosmic reference in which case time may not be constant or linear. Time as such does not exist, but it's concept is modern convenience to compare different cycles for earth processes. Is this vedic time system matching age of earth ( about 4.6 billion human years by mostly heared from science . Nice Article and well written. I like to mentioned more details. 5) 100 Years of Shiva is 1 "Pal" of Shakti. 7) Narayana have 100 years of "Svapna Avastha" when world run, 100 years of "Sushupti Avastha" which is deep sleep. 100 Years of "Jagrad" Avastha when is Narayana is awake. When Narayana get in "Svapna Avastha" , he creates this world as it was before with word "Om ekom Bhau-shyam" and make it "small" in "bija" by saying "Om-soham" when he completes 100 years of "Svapna Avastha". 11) Ishvar Brahma shrusti is consist of 3 lokas " Swarga", "Mrutuyu" , "Patala". please provide reference from Vedic Scripture. this time cycle is correct. there is one kerala man who knows the truth of this calculation. The lifespan of Devas is 100 devas year (= 36,000 human years) is 100% wrong. The lifespan of Devas is 10,00,000 devas year (= 36,00,00,000 years). Only 14 Indras rule a Kalpa. Thank you for your efforts on the calendar. Is 60 - Year Luni Solar Cycle was written in any Hindu Books such as Veda or anything? Please reply me as early as possible. If 60 - Year Luni Solar Cycle is not written in your religious books, certainly you are cheated by your religious leaders. Ok? We don't care what western cullender says. Our Vedic Calender gives perfect information of Eclipse with perfect time and space plus its effects on living organisms. Vedic Calender also give perfect information about positions of stars and planets in space and their effects on human life. Remember Vedic Calendar give all these information without using Artificial Satellite. So there is no way of cheating if everything happens in space as per dictation of Vedic Calendar.